In the last post we looked at three of the reasons moms don’t know their true selves—time, social media comparisons, and our fake world. This week we will look at two more. Caregivers (aka moms) give loads of love and care to others. It’s what we do. We give in the morning when we make breakfast for the family and pack lunches for the day. We give in the afternoon when we shop for groceries, clean the toilets, or pay the bills. We give in the evenings when we make yet another meal and help with homework. We give from sunup to sundown, making sure everyone has exactly what they need. But after a while, all this giving can lead us to believe that it’s selfish to receive. It just feels wrong, like we’re stealing time and energy from our families, which is why we grapple with self-care and asking for help. And then there’s our faith. We’re taught as Christians that we’re to be selfless, not selfish. We’re to lay down our lives for others rather than look out for number one. Granted, this is a valid teaching in the Bible and one that I am grateful for, but we’ve mistakenly made this an either/or proposition. Either you sacrifice yourself or you’re selfish, with little room for anything in between. It’s true, God doesn’t want you to be driven by selfish ambition (Philippians 2:3). We are not to think too highly of ourselves (Romans 12:3). But that doesn’t mean He wants us to ignore ourselves or live in the dark about the gifts and strengths He’s entrusted to us. In the parable of the talents, Jesus tells us of three servants who’ve been entrusted with God’s property. The first two put their talents to work and earned a profit on the master’s return. They received high praise from God. But the third servant, motivated by fear rather than a desire to serve, dug a hole and hid the master’s talents. We do the same exact thing when our fear of selfishness causes us to ignore ourselves and allow our talents to remain buried. It’s an issue of stewardship. 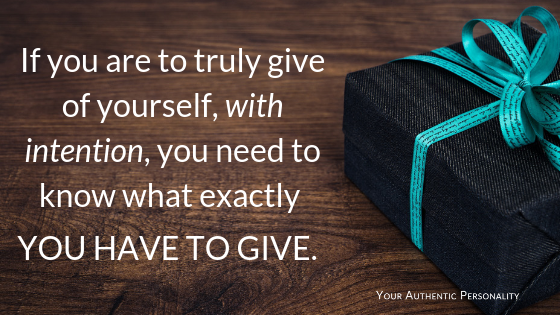 If you are to truly give of yourself, with intention, you need to know what exactly you have to give. Your dentist wants you to floss. Your HOA wants you to paint your house. Your husband wants a hot dinner. Your kids want your undivided attention. Your dog wants you to take him for a walk. Your mother wants you to call her. Everyone wants a piece of you and there’s not enough to go around. Moms are pressured every day by the expectations of others. I surveyed more than 600 women, most of them moms, and asked them to rate the degree to which they feel that type of pressure. The question was stated like this: “On a scale of one to ten with one being not much and ten being very much, how much do the expectations of others affect you?” Sixty-seven percent of women said seven or higher with over half of that number reporting nine or above. That’s a lot of pressure. How’s a mom supposed to know herself, much less be herself, when a multitude of voices from her church, her employer, her family, and her friends, are all pointing her in the “right” direction and telling her how and where to march? Don’t ever stop fighting to know and steward your authentic self. Here are 5 things you can do to overcome the obstacles that keep you from your true self. Make the time to know who you are. Schedule it like an appointment. Take a break from social media when it’s getting you down. Pursue authenticity and authentic people. Make your faith bigger than your fear. Know God’s true heart for you and those around you. Turn up the volume on God’s voice by learning to hear Him. Understanding your true self will absolutely make you a better mom, wife, and person.